Though in one sense Mr. Pence’s trip was a routine visit with service personnel ahead of the holidays, it was also bound to bolster the standing of President Ashraf Ghani amid a political showdown with a powerful northern governor. This week Mr. Ghani fired Atta Muhammed Noor, who had led the northern economic hub of Balkh Province for 13 years. Mr. Noor has defied him, though, refusing to leave office until his party’s conditions are met, including the right to choose his successor. Instead of Air Force Two, the vice president flew in an unmarked C-17 transport plane to Bagram Air Base, where he met with the senior civilian and military American leaders in Afghanistan. Bad weather made it uncertain until the last minute whether he would make the trip from the base to Kabul; his party’s helicopters were stuck on the tarmac for 20 minutes before departure, then circled a couple of times over the dark, smoky capital before landing. Previous visits to Afghanistan by senior Trump officials have faced enormous security challenges. The Taliban fired dozens of rockets at the Kabul airport while Defense Secretary Jim Mattis’s plane was parked there. When Secretary of State Rex W. Tillerson visited, Mr. Ghani and other top Afghan leaders were helicoptered to the Bagram base to meet him so he would not have to venture outside it, which caused a political uproar for the Afghan leaders. Mr. Pence greeting troops at Bagram Air Base. He said the Trump administration had empowered their commanders by giving them more flexible rules of engagement. 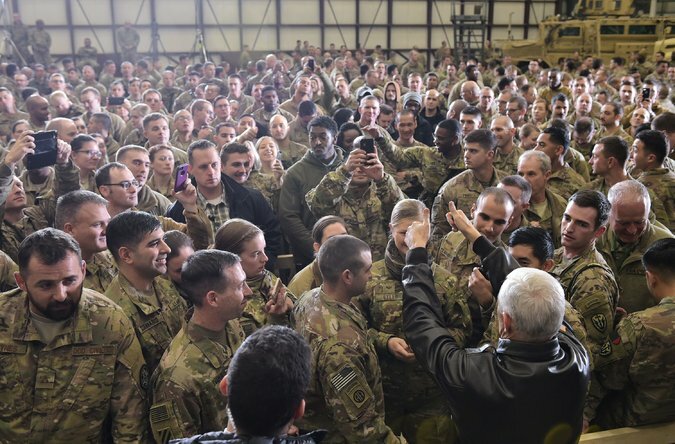 At Bagram, the largest American military base in the country, Mr. Pence spoke Thursday to soldiers from a stage decorated with a Christmas tree and an inflated Santa Claus. He thanked them for their service and said the Trump administration had empowered their commanders with more flexibility in their rules of engagement. Mr. Pence said Mr. Trump’s Afghan strategy was part of a broader attempt to bring stability to the region, including increasing pressure on Pakistan, which for years has allowed the leadership of the Afghan Taliban to plan the insurgency from its soil, despite protests from three American administrations. As the Taliban continue to wage war across the country, Afghan forces trained and advised by the United States-led NATO coalition are also fighting Islamic State affiliates in at least three of Afghanistan’s 34 provinces. Around dawn on Friday, Taliban militants drove a vehicle packed with explosives into a police base in the Maiwand district of Kandahar Province, a tactic the insurgents have repeatedly used to deadly effect in the district and elsewhere in southern Afghanistan. Gen. Abdul Raziq, the police chief of Kandahar, said that the explosion killed six police officers and wounded three, but that the militants had been unable to infiltrate the compound. Ask Well: Is It Better to Cook With Coconut Oil or Olive Oil?